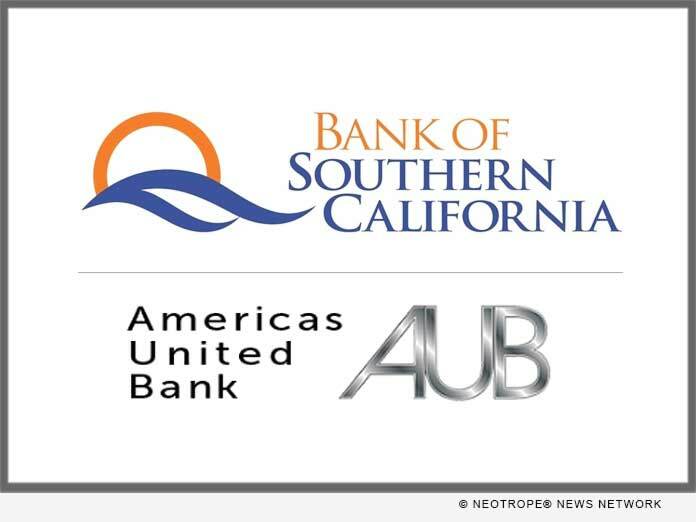 SAN DIEGO, Calif. /California Newswire/ — Bank of Southern California, N.A., San Diego, California (OTC Pink: BCAL / OTCMKTS:BCAL) announced today the completion of its acquisition of Americas United Bank, Glendale, California (OTC Pink: AUNB), effective July 31, 2018. Americas United Bank had total assets of approximately $231 million as of June 30, 2018. Americas United Bank branches will begin operating as Bank of Southern California branches on August 1, 2018, with systems conversion scheduled in October 2018. The acquisition of Americas United Bank provides Bank of Southern California with an entry into the vibrant Los Angeles market as the Bank continues its strategic expansion in the Southern California region. With the completion of the acquisition, the combined bank will have assets of approximately $720 million, and increases the number of Southern California branch locations to eleven. “We are pleased to welcome Americas United Bank customers, employees, and shareholders to Bank of Southern California,” commented Nathan Rogge, President and Chief Executive Officer of Bank of Southern California. “This strategic acquisition provides us with a presence in Los Angeles County and a footprint that allows us to now serve four major metropolitan Southern California markets. Our long-term goal is to build a community business bank in Southern California that supports the economic growth of businesses and the communities we serve,” concluded Rogge. Bank of Southern California also announced that its Board of Directors appointed Adriana M. Boeka as a non-executive director. Mrs. Boeka previously served as President and Chief Executive Officer of Americas United Bank. Additionally, Bank of Southern California recently hired Gaylin Anderson, as Executive Vice President, Market Executive to lead the Bank’s expansion into Los Angeles County. Mr. Anderson most recently served as Managing Director of Community Banking for Banc of California. MJC Partners, LLC served as financial advisor and Duane Morris LLP served as legal counsel to Bank of Southern California. Keefe, Bruyette & Woods, A Stifel Company, served as financial advisor and King, Holmes, Paterno & Soriano, LLP served as legal counsel to Americas United Bank. A growing community bank, established in 2001, Bank of Southern California, N.A., with headquarters in San Diego, Calif., is locally owned and managed, and offers a range of financial products to individuals, professionals, and small-to-medium sized businesses. The Bank’s solution-driven, relationship-based approach to banking provides accessibility to decision makers and enhances value through strong partnerships with its clients. The Bank currently operates eleven branches in San Diego County, Los Angeles County, and the Coachella Valley in Riverside County, and a production office in Orange County.